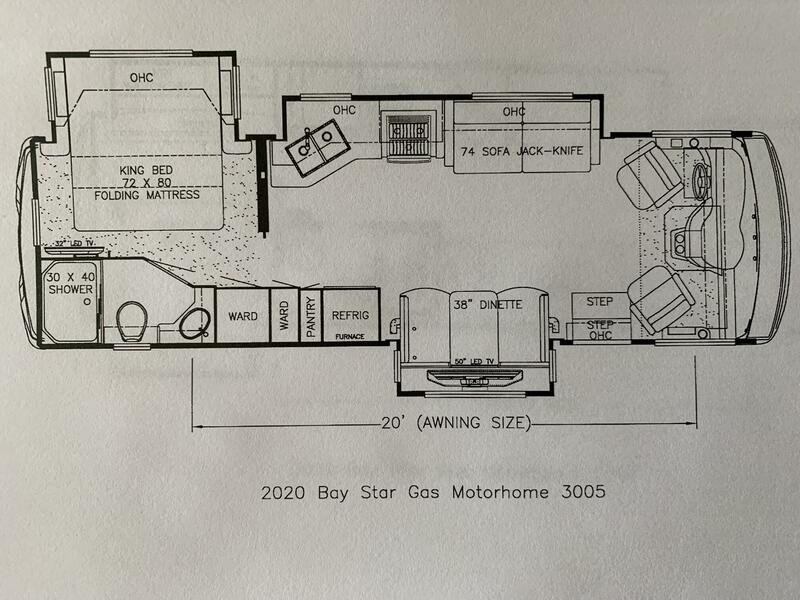 One specific item Newmar’s Floor Plan Team had as an objective for 2020 was to improve, even ever so slightly, the amount of room between the bed and the nightstands in its gas products. The intent was to make it easier for the customer to make the bed and more easily getting their hands between the bed and the night tables. The 3014, 3124, 3226, 3401, 3408, 3414, 3609 and 3626 Bay Star models have been carried over for 2020. The Bay Star 3419 and 3628 models will not be offered. 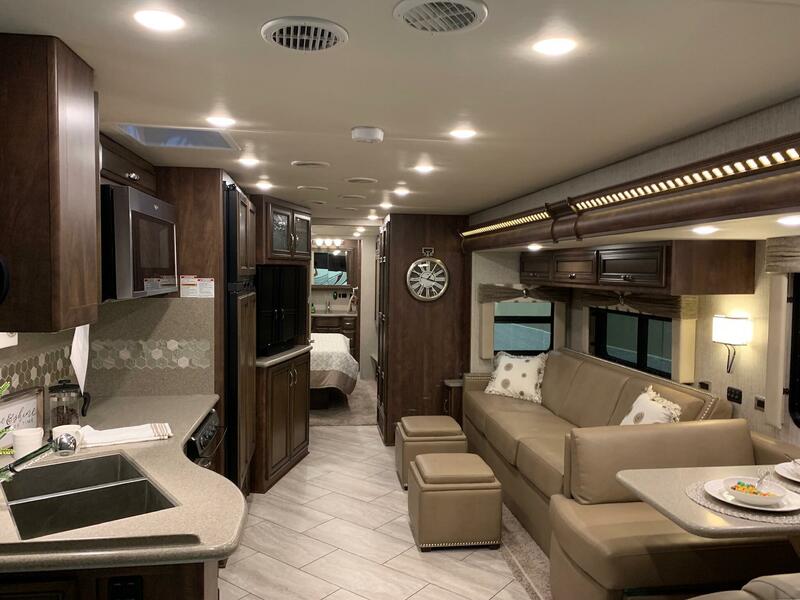 This new Bay Star 30’ model utilizes the folding mattress concept introduced in the very popular Bay Star Sport 2813 floor plan, and adds 2 feet to the overall length. 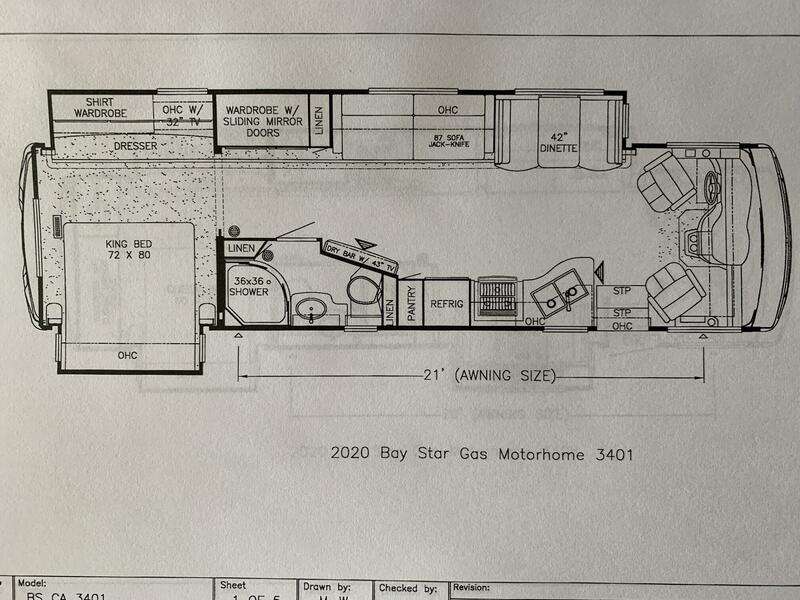 The front living area offers opposing slide rooms, with a roomy galley and 74” sofa on the off door side, across from a slide containing a patio side dinette booth w/ an LED television on a power lift or “televator”. 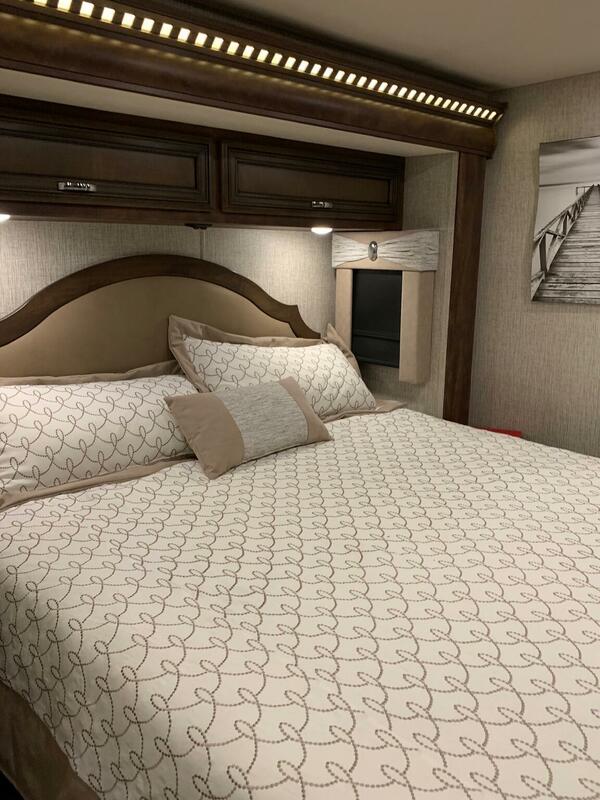 Door side and mid-ship, the 3005 provides a refrigerator with roomy pantry, and two large wardrobes – one just outside and one inside the pocket door that separates the bedroom from the front living area. The bedroom offers a full 72” X 80” king bed with folding mattress that allows the bed to contract when the bedroom slide needs to be brought in. 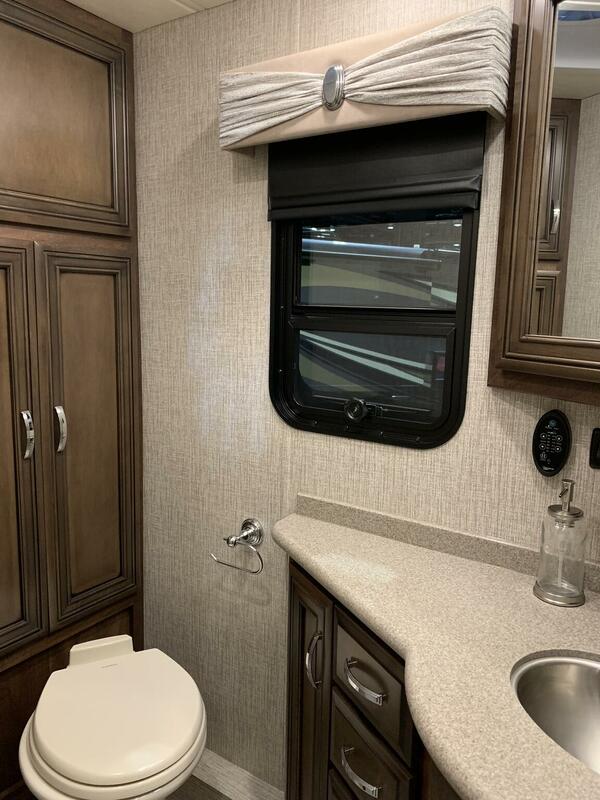 Across from the foot of the bed is an enclosed full bath with 40” X 30” shower, commode and corner vanity. 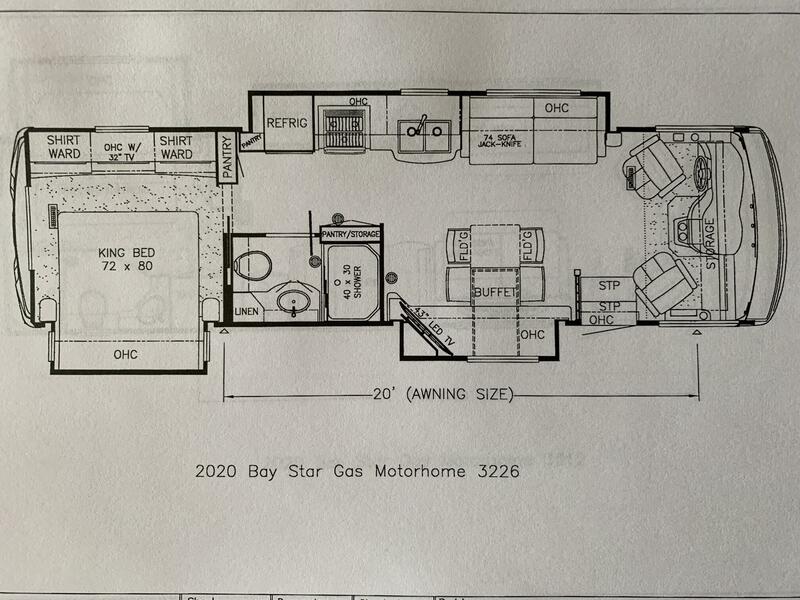 The Bay Star 3312 is a new double slide floor plan that offers opposing sofas in a model that is only 33’ 11” in length. 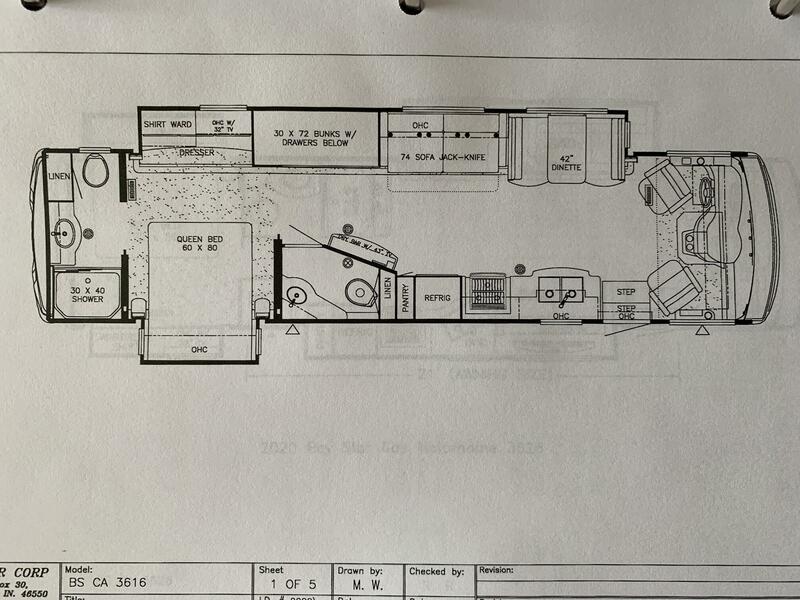 The front living area features a slide room on the off door side that contains a 74” sofa and a very spacious and functional galley. 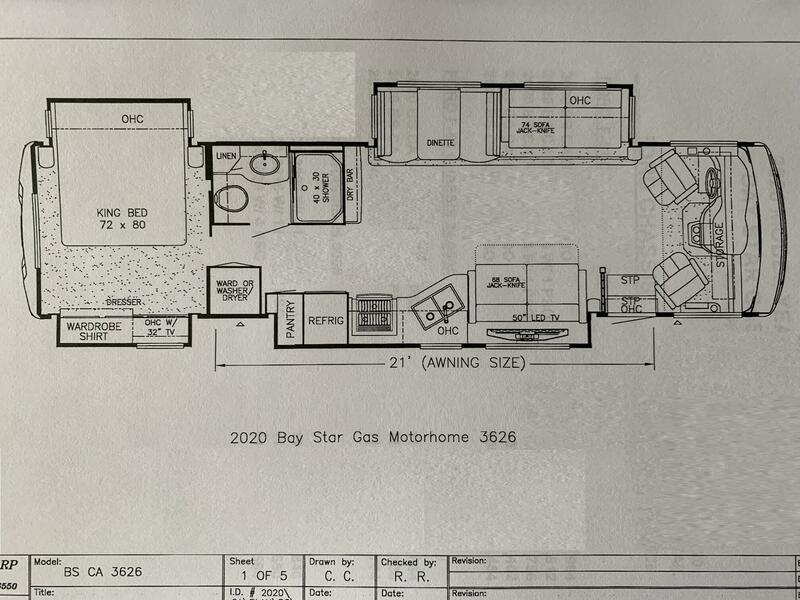 On the door side is a second, opposing 68” sofa with “televator”, and dinette facing the patio side of the motor home. Rear of the dinette is a roomy pantry. A pocket door separates the front living area from the bedroom, which features a large wardrobe, and a full 72” X 80” king bed with folding mattress that allows the bed to contract when the bedroom slide needs to be brought in. Also located in the bedroom, is additional storage forward of the king bed facing toward the rear of the coach. 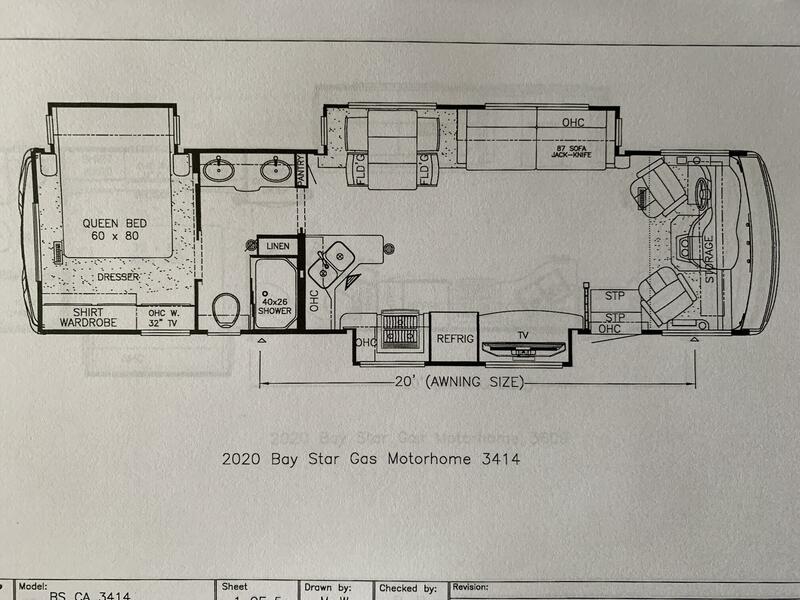 The new Bay Star 3316 floor plan is a full wall slide bath and a half model with 30” X 72” bunk beds. 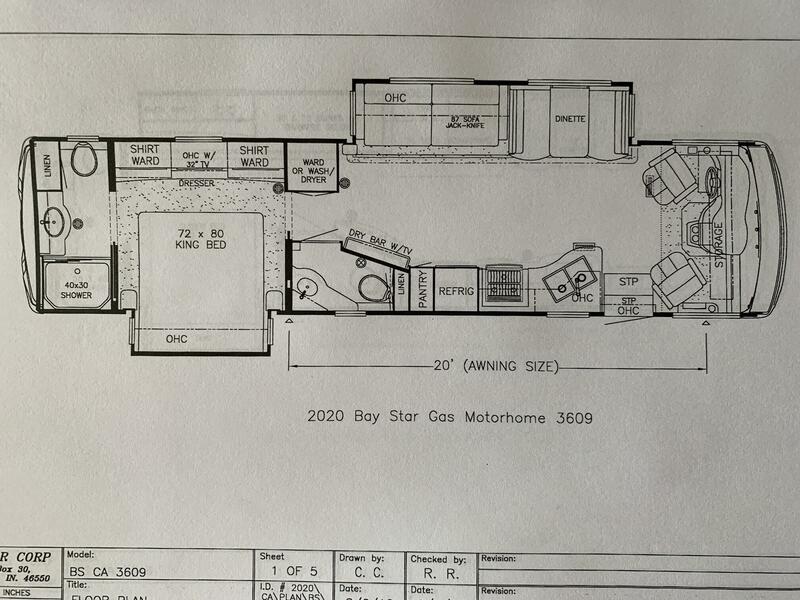 This new model offers a booth dinette and 74” sofa in the full wall slide on the off door side in the front living area. Located on the door side, is a very large and spacious kitchen complete with refrigerator and pantry. 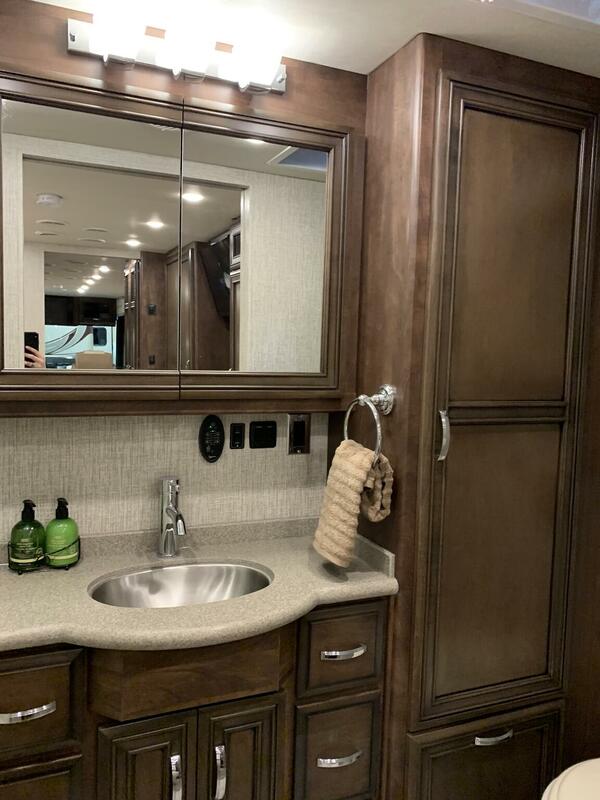 Located mid-ship are a set of 30” X 72” bunk beds, across from which is a roomy half-bath with a large television and dry bar along the bath wall facing the sofa. The master bedroom offers a queen bed, shirt wardrobe and television. Behind the master bedroom is a full bath area, complete with a 40” X 30” shower, roomy vanity and large linen storage. The Vizio brand televisions previously used in Newmar’s gas brands in 2019 have been upgraded to Samsung brand models for the 2020 model year. 2 Blu-Ray disc players are standard in the 2020 Bay Star, as these were selected on 94% of the Bay Star orders during the 2019 model year. Soft close mechanisms are a new standard feature on most drawers in the 2020 Bay Star. A new Villa Comfort Fit booth dinette is the standard dining furniture in Bay Star for 2020. This booth provides better seating comfort and also allows the customer to convert this dinette into a small bed. A 4th wood grain finish has been added to Bay Star for 2020 called “Arctic Maple Glaze”. The Ford F53 chassis with a GVWR rating of 26,000 pounds is standard on Bay Star 36’ models for 2020. A Xantrex 1200 watt pure sine wave inverter replaces the 1000 watt model previously used on the Bay Star 3014, 3226, 3408 and 3626 models, which feature lift pumps requiring more power capacity. This new 1200 watt inverter has a built-in transfer relay and increased surge capacity. 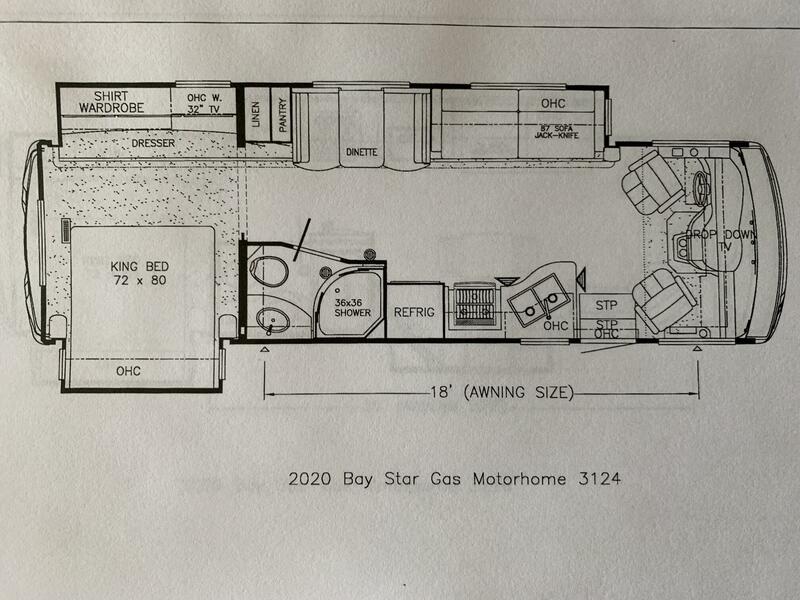 The 2020 Bay Star features a redesigned sewer hose port in the floor of the water works compartment. This enhancement provides a sump to recess the port making easier to clean up. This was done in response to customers’ requests. 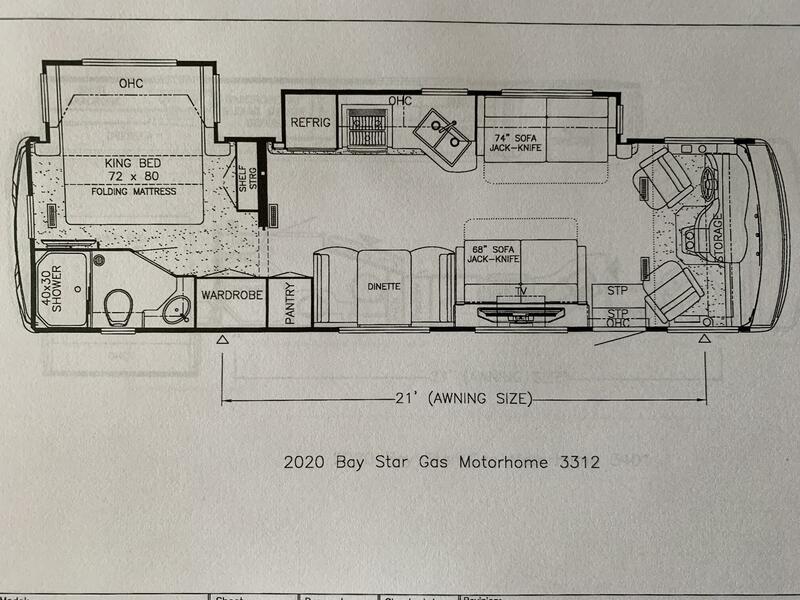 The 2020 Bay Star has new exterior paint graphics for 2020. 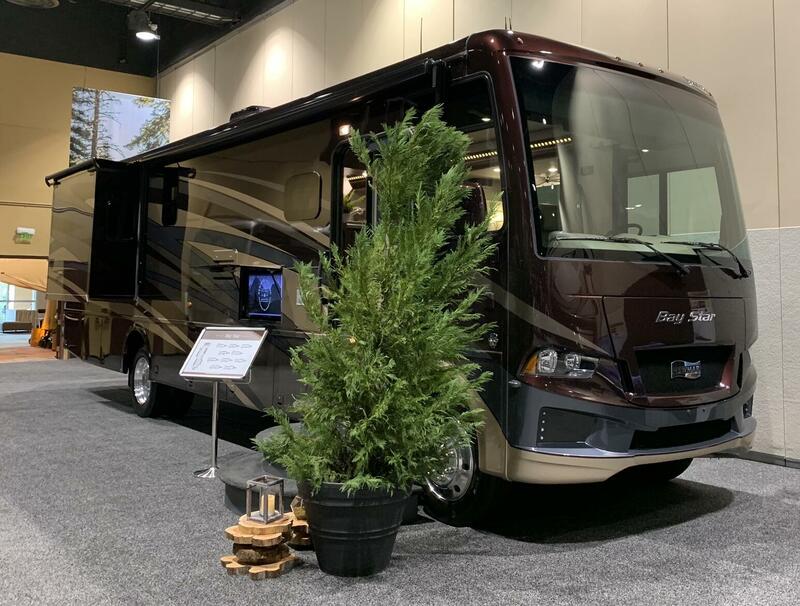 Three exterior graphics (instead of only 2 offered previously) will be available for the 2020 model year on all Newmar gas products. Two-stage struts replace the adjustable strut brackets on top hinged baggage doors for 2020. 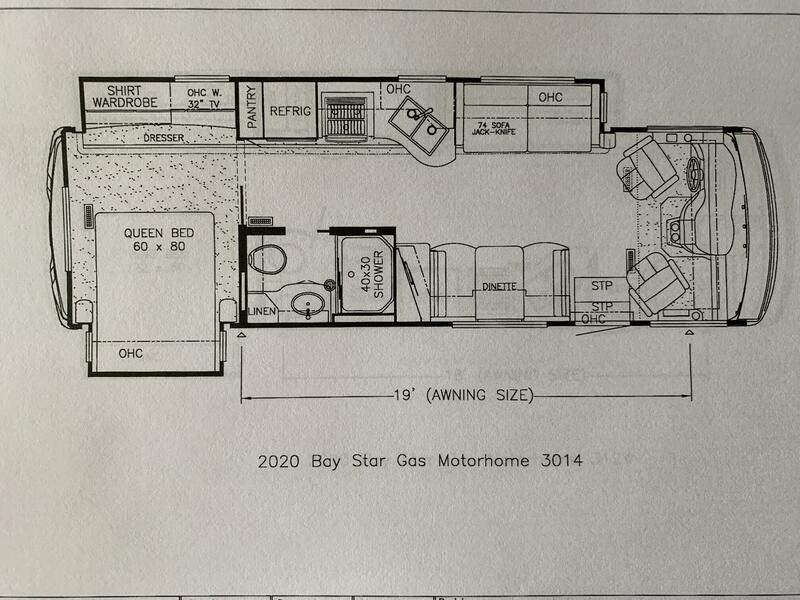 New decors, including a 3rd choice of interior fabrics, will be available on the 2020 Bay Star. These new interior décor packages will also feature new colors for the dash in the front cockpit area. 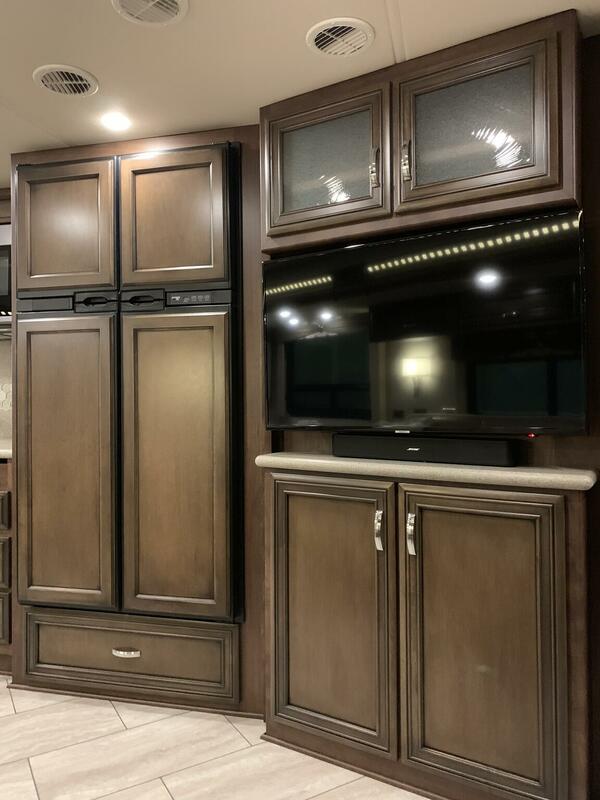 The square knobs featured on all drawers in Bay Star for 2019 have been replaced with the same hardware (pulls) used on the cabinet doors for the 2020 model year. The scissor style automated mechanical lock arms introduced in the 2019 Ventana are standard in the 2020 Bay Star. 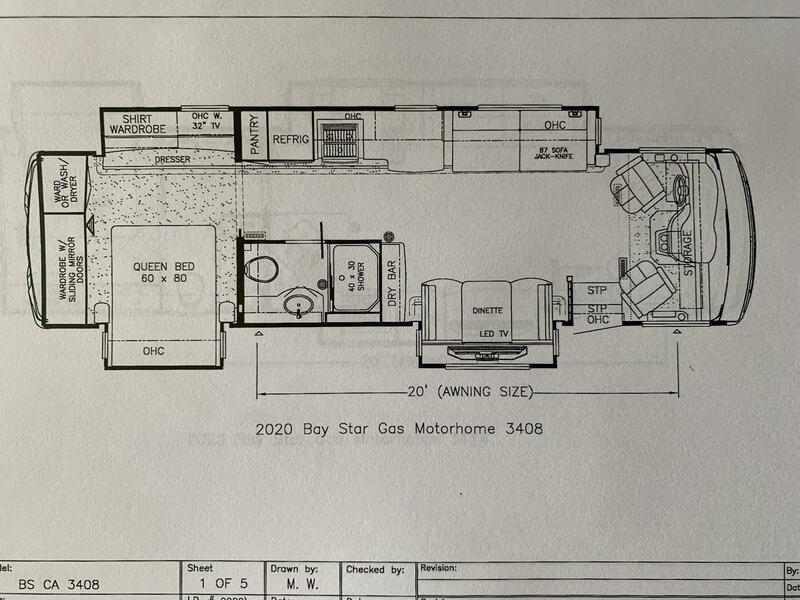 An A & E 9100 series power patio awning is a standard feature in Bay Star for 2020. This replaces the previous model awning as it has been obsoleted by Dometic. This new awning used motion sensor technology rather than a wind sensor. The patio awning includes LED strip lighting for 2020. Splendide two piece 120 volt washer and dryer replace the Whirlpool models used in 2019. These units are a matching set, where the Whirlpool units did not share similar designs. A new option (L285) for a dedicated 1200 watt inverter to power the electrical outlets in the bed base, nightstand and overhead cabinet in the bedroom is being offered. This option also includes one extra 110 volt receptacle inside the cabinet at the head of the bed located in the center of that cabinet, as well as pass-through ports in the bottom of the overhead cabinet at both sides of the bed. This option is specifically intended to accommodate customers’ requests for a way to more easily accommodate C-PAP machines. One large window will be featured in the option for 2 recliners. This follows closely what Newmar has done with recliner options offered on its hi-end luxury brands. Option L280 offering the TV inverter, will provide a 1200 watt Xantrex pure sine wave inverter rather than the 1000 watt model previously offered in 2019. This new 1200 watt inverter has a built-in transfer relay and increased surge capacity over the current model. Just a note that, whenever any 2020 Bay Star order calls for 2 or more options that require additional dedicated inverters, the multiple optional inverters will be replaced with a single 2000 watt inverter with six 6 volt batteries to power all of the selected options. This will not be visible on the order forms, and nothing changes with regard to descriptions of the individual options on the order forms. This is simply an electrical configuration that will be defaulted to whenever 2 order more options with dedicated inverters are called for on an individual ordered Bay Star.